Thibaut Malet loves wood. This should be taken literally (although we can imagine it scrawled across a middle school locker). His expertise allows him to make incredible things that are both functional and beautiful. 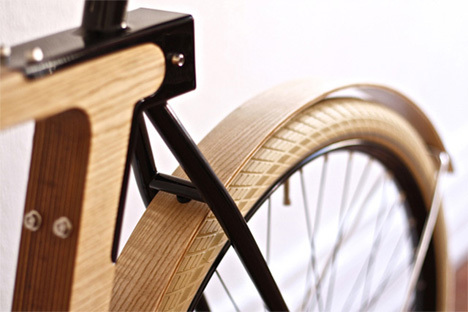 His newest creation is the WOOD.b urban bicycle. 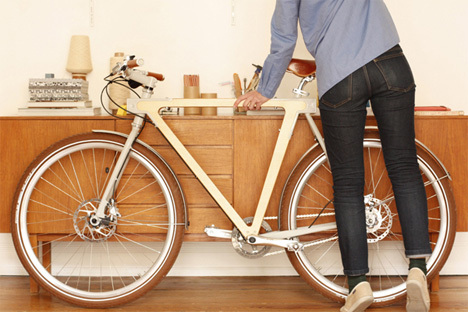 Created in collaboration with Strasbourg-based bicycle company BSG, the bike is almost entirely wood, with a little steel to hold it together and make it go. The bike is gorgeous and looks rather more like a sculpture than a functional piece of sporting equipment – it looks at once too lovely to function and too sweet not to take out on the road. The fascinating fusion of wood and metal explores the relationship of materials used in unexpected ways. See more in Bikes & Cycles or under Transportation. July, 2013.